View from ground level Monday of the new wildlife-only overcrossing on I-90 east of Snoqualmie Pass. Deer have already begun using an unfinished wildlife bridge over Interstate 90 east of Snoqualmie Pass. The Washington State Department of Transportation on Monday celebrated the opening of a section of widened freeway there. The new overcrossing is expected to reduce frightening animal-vehicle collisions. 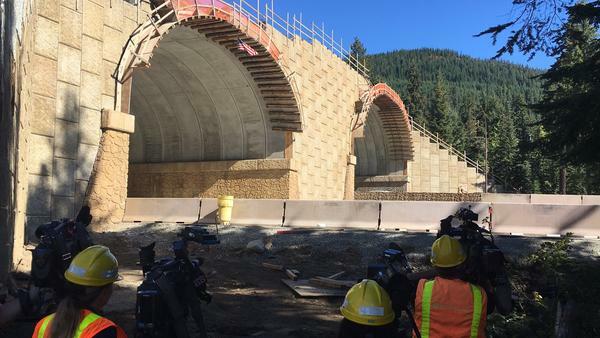 Drivers traveling over the pass may recall the broad, critters-only overpass because of its distinctive twin arches over the newly widened, six-lane freeway. The bridge still needs landscaping on top and sidewalls, but WSDOT's Meagan Lott said the first deer have already tried it out. "Despite all of the major, heavy machinery that is being used on top of this crossing, we are seeing wildlife starting to use it as if nothing was happening," Lott said in an interview. The animal bridge is scheduled for completion next spring. It will be the first critters-only overpass on busy I-90. A pair of wildlife underpasses are part of this phase as well, one of which is already done. "We'll see things as big as possibly bear and cougar to as small as raccoons, pikas and small rodents," Lott said. "It's going to be a large variety of wildlife." 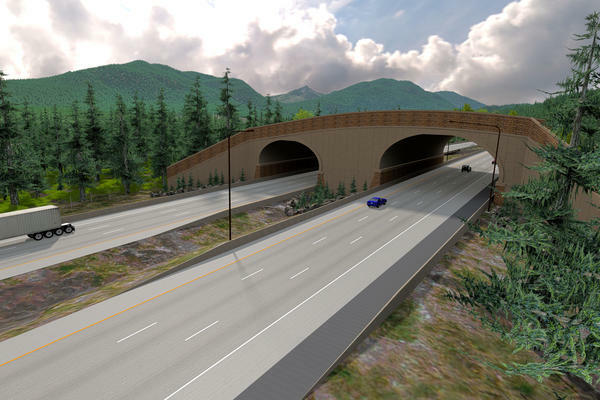 Lott said the long term plans for the cross-state corridor through the Cascade Mountains encompass 27 total wildlife crossing structures to bolster habitat connectivity and traveler safety. That includes several more wildlife-only bridges as part of a freeway widening phase by Easton that begins in 2021. Oregon's Department of Transportation credits two wildlife underpasses south of Bend on Highway 97 with reducing animal versus car crashes in that area by 86 percent. Those were completed in 2012 as part of a widening project. Another undercrossing is in the cards further south. "Considering the project’s success in reducing deer/vehicle collisions, the average cost of a single deer/vehicle collision in the U.S. ($6,633 in 2012), and that the structures will provide benefits for 50 to 75 years, it made good economic sense to address wildlife," the Oregon Department of Fish and Wildlife wrote in a "Strategy Spotlight" web post. "The upfront costs are expected to be recouped in 10 to 12 years, and from that point on, the project will continue in the green for decades to come." Tall fencing along the highway is an important project component to funnel animals -- such as deer, elk and bobcats -- to the safe crossings. ODOT has plans to build another wildlife underpass for deer and elk near Gilchrist as part of a project to add passing lanes to Highway 97 in 2019. Another high kill area on Highway 97 is in north central Washington's Okanogan County. Three nonprofits -- Conservation Northwest, the Mule Deer Foundation and the National Fish and Wildlife Foundation -- have teamed up this year on a campaign to raise $300,000 to install a wildlife underpass near the Carter Mountain Wildlife Area. Wildlife crossings have previously been installed and gotten good reviews near Pinedale, Wyoming, and along Highway 93 north of Missoula, Montana.